Track up to 6 different temperatures simultaneously, whether grilling or smoking, or even both, using your iPhone or Android device. Just set your preferences and let GrillEye® do the rest for you. 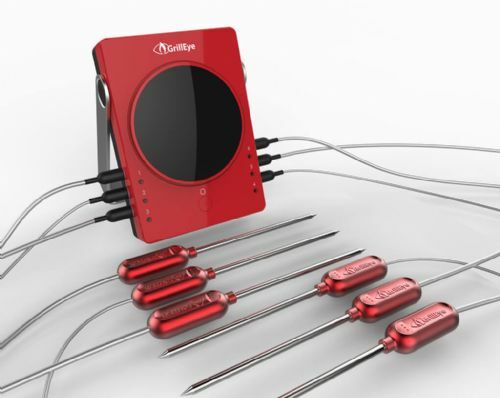 It includes the GrillEye® Probe Clip for ambient temperature readings. Withstands up to 380℃ - 716°F. Measures up to 300℃ - 572°F. Employing an extra-long wire, GrillEye® probe can be used even in grills with big housing. The GrillEye® probe is approved by the FDA for safe use with food. The GrillEye® probe is made of space-grade aluminum for durability and safe use under any condition while grilling. 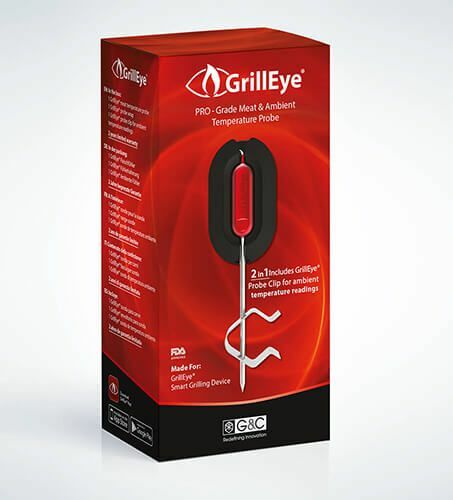 Grill or smoke any meat to perfection by keeping precise track of the corresponding temperature using the GrillEye® meat or ambient probe. Clean the probe without worrying about damaging it. Moldings are quality sealed, making the probe highly resistant to water. The aluminum used on the grip of GrillEye® meat probe can withstand direct exposure to fire for a limited amount of time thus making it the most durable temperature probe ever made. Employing an extra long wire, GrillEye® probe can be used even in grills with big housing. Stack all of your GrillEye® meat probes, one on top of the other, and store them in an orderly way until next time.